Faithfully reproduce every aspect of the scene, even in low light. The Exmor R®(tm) CMOS sensor’s distinct design puts wiring behind the light-capturing photo sites for vastly improved sensitivity and reduced noise. Combined with higher-speed parallel signal processing and more rapid signal conversion, images have a wider dynamic range and rich gradations for intense detail and clarity. Capture epic wide angle views with the 170˚ ZEISS® Vario-Tessar® lens. Or switch to a more conventional 120˚ view. Either way, leveraging over 150 years of experience in precision optics, the ZEISS® lens gives your recordings intense contrast and sharpness, free from glare and reflection thanks to an advanced multi-layer coating. Using the optional RM-LVR1 Live View Remote accessory you can control up to five cameras via Wi-Fi® right from your wrist. Frame your shots, control the cameras’ recording settings, and start/stop recording to get impressive footage from five sources simultaneously. These impressive stats ensure you have plenty of creative options: get up to Full HD resolution and 28 Mbps video bitrates, and frame rates from 50p all the way to 240p super-slow motion. Shoot on the fly without shakes and bumps. 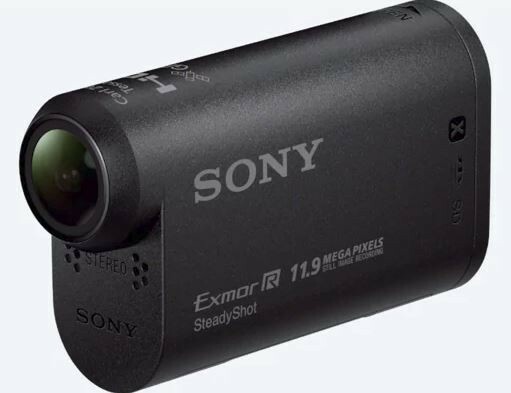 Electronic SteadyShot image stabilization works inside the camera to combat camera shake, whether shooting in wide angle or full telephoto. Motion sensors detect hand shake and other camera movement, which electronic SteadyShot then compensates for with a dedicated buffer area on the sensor. It's hard to get great selfies or videos with you in the heart of the action. With no viewfinder/screen, it's tough to know what you're really capturing. Seeing it live on your smartphone is the solution; Wi-Fi® capability lets you turn your smartphone or tablet into a remote viewfinder and controller. Whether you're skateboarding your favorite streets or biking a tough trail, don’t miss recording the action — long battery life lasts up to 150 minutes. Sealed in the housing, the camera is waterproof down to 16.40 ft and has a shock resistance rating up to 8.20 ft drops. Additionally, dirt- and dust-resistant seals make it nearly impervious to mud, snow, rain, and grit. The Action Cam also feature a versatile embedded universal tripod mount.